Can the Family Pet Protect Your Child From Eczema and the Symptoms of Asthma? Not that you need another reason to get that dog you’ve always wanted, but a new research study presented at the American College of Allergy, Asthma and Immunology (ACAAI) Annual Scientific Meeting has suggested that children who grow up in homes with dogs may be protected from developing eczema as well as asthma. Eczema is a condition that is characterized by dry itchy skin, usually on the feet, face and hands, and rashes. Eczema and asthma are atopic conditions, meaning the condition is connected to allergen hypersensitivity. Although the exact cause of eczema is unclear, there is a consensus that it may occur when the immune system overreacts when responding to certain irritants or allergens. The good news is that by getting a dog, you may inadvertently be protecting your children from eczema and ease their symptoms of asthma. Can Children Benefit From Bacteria? The short answer is-children may need to be exposed to certain types of bacteria. Research has found that exposure to germs during childhood will help to strengthen the immune system and reduce the risk for childhood allergic and respiratory diseases, including asthma. One study found that the bacteria in dust from homes with dogs, was significantly different than the dust from homes without dogs. It is believed that the microbes found in the dust from the house with a dog may modulate immune responses, colonize the GI tract and protect its host from an asthma genic pathogen. Another study, which included 188 children with asthma, involved looking at dogs and how the symptoms of asthma were linked to the bacteria found on the dog and its own allergens. This study found that exposure to the non-allergen bacteria on dogs reduced the need for an inhaler and reduced the nighttime asthma symptoms. How Can a Dog Protect Your Child From Eczema? Researchers collected data from on prenatal exposure to dogs (inside the home for at least one hour a day) from several hundred mother-child pairs. When researchers compared the children who had a prenatal exposure to a dog to the children without exposure, the risk of eczema was reduced by about half in children who were exposed. Researchers also found that children who were allergic to dogs were less likely to develop eczema if a dog was in their home during the first 12-months of life and children with allergies to dogs who didn’t own a dog were four times more likely to develop eczema compared to allergic children with dogs. Children who were not allergic to them were slightly more protected when living with a dog. 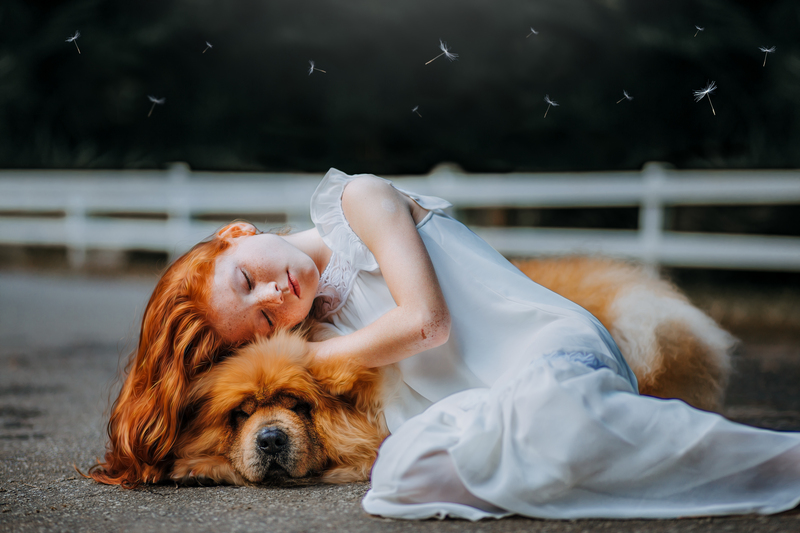 Although allergic children may find some relief from asthma as well as be protected from eczema when they are exposed to a dog, it is essential that you take the appropriate measures to prevent or reduce the risk of an allergic reaction. You can reduce the chances of children coming into contact with dog dander and hair by using a HEPA air purifier, vacuuming frequently to remove hair and dander from carpets, drapes and furniture, washing your dog once a week with a dander reducing shampoo and wash your hands after touching the dog.